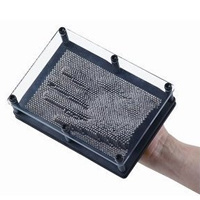 Put your imagination to the test with this great Pin Art desk toy! Wherever you are - at school, work or home - you can be entertained for hours exploring the limitless sculpture making possibilities of Pin Art. And it's so simple to use! 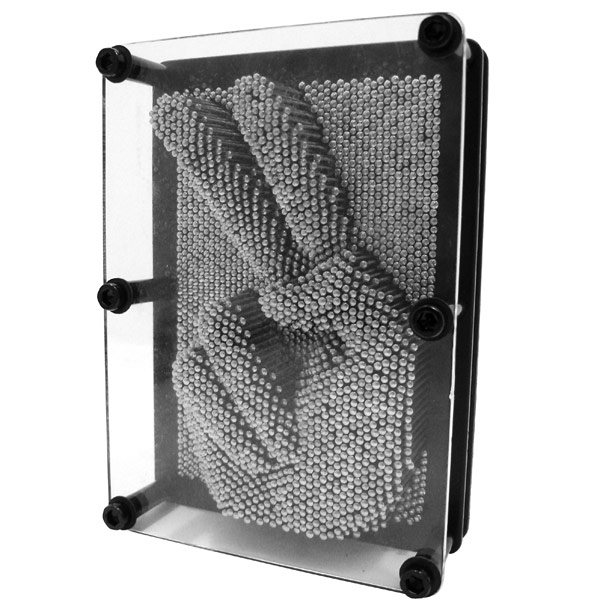 Just tip the frame so that all the pins touch the perspex, then slide them over any object to create a 3D impression! Carefully separate the frame from the object and there you have it - your own unique sculpture! You can even make an impression of your face, but make sure you're eyes are shut first! The impression remains intact as long as the device is not disturbed. Stylish in silver and black, until you decide to flip the pins back over and start on something new! Dimensions: 17.5cm x 4.5cm x 12cm.